Thomas Keller’s Ad Hoc restaurant in Yountville is throwing a block party fundraiser on Saturday, October 9 from 5–10pm. There will be live music, a BBQ pit, wood-fired pizza oven, an Ad Hoc Open House, and four courses of food paired with wines. All proceeds benefit Clinic Olé, a community health organization that serves low-income and uninsured residents of Napa County, and the ticket price is tax deductible. For you bloggers out there attending BlogHer Food ’10 in San Francisco, this is on the same day as the second day of the conference, so plan accordingly if you want to attend. If you’re not attending BlogHer Food, then come out and support the cause! If you have any questions, let me know and I can find out answers for you. Otherwise, call Ad Hoc at 707.944.2487 for more information or to buy tickets. It was so great meeting you at IFBC! This sounds amazing and I wish I could afford it. Don’t know how I could swing it though, still trying to figure out how to cover my travel expenses! Great meeting you, too, Diana. Always nice to have someone I can talk to about Hawaii. :) If you can manage it, I think there may be a BlogHer splinter group that heads up there. We will be serving outside only in street vendor or buffet style. There will not be any sit down dining. It will be purely passed appetizers, canapés, live music and so much fun. The pricing is correct. 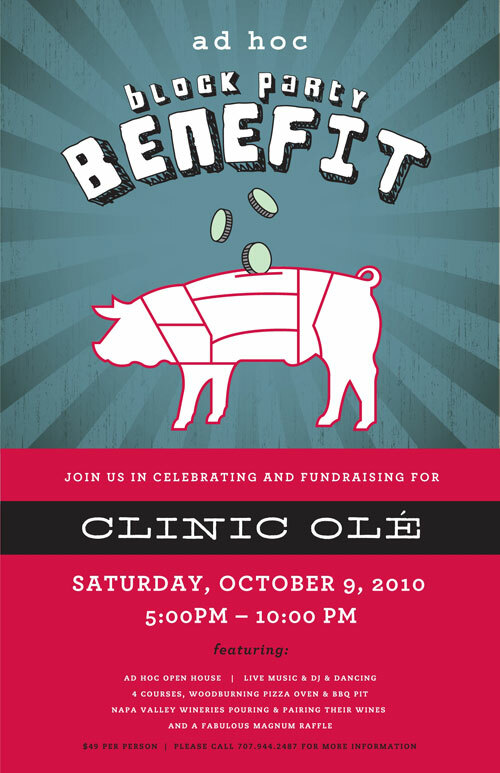 we are still working out the details for the party but all in all it’s like an open house for us where the profit benefits the clinic. Thanks for following up, Jeff.